Encompass™ Current Transformers from GE offer electrical utilities piece of mind knowing they’ll have the right CT in stock. Upgrade today and eliminate the need for multiple current ratios, thereby simplifying CT selection. Encompass wide range CTs are designed for commercial and industrial applications. 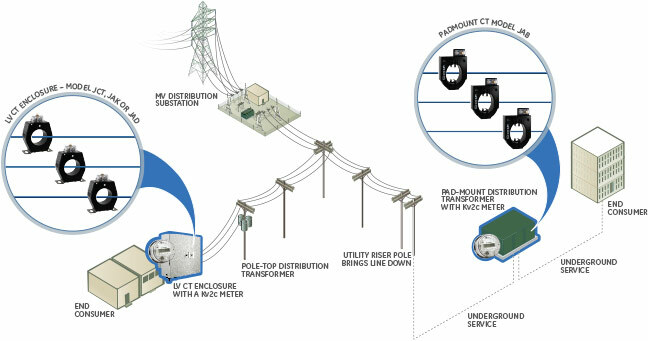 Encompass CT’s substantially reduce inventory, complexity and improve standardization for meter shop operations, particularly when used with GE’s kV2c FITZALL™ transformer rated meters. With a rating factor between 1.0 and 4.0. 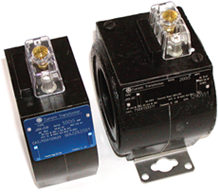 A rating factor of 4.0 means the Current Transformer meets rated accuracy at up to 4 times the rated primary current. Thus, the output on a 5 Amp CT secondary can be used up to 20 Amps if a rating factor of 4.0 is assigned to the CT (4.0*5A = 20A). This pairs the CT output range and the Meter input range when used with a CL20 transformer rated meter, maximizing the performance potential of the system. 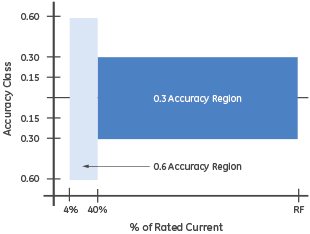 The 4% and 40% test points in combination with a high rating factor of 4.0 means 1 Encompass CT can equal or better the performance of both higher AND lower ratios. 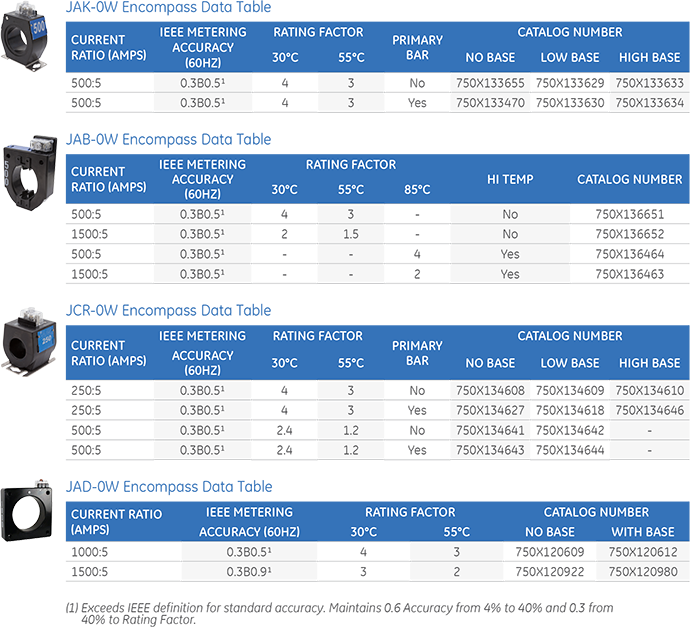 The 500:5 Encompass unit when compared to a 200:5 standard CT has equal to or better test results at all points included even low currents and is available at an equivalent price. This comparison holds true across several other standard CT ratios, meaning one Encompass CT can functionally replace up to eight other standard ratios, allowing for an inventory reduction of up to nearly 90%. 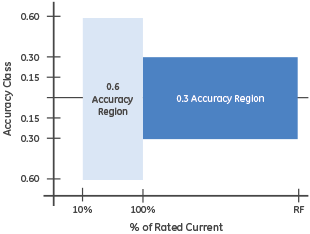 A 500:5 Encompass CT has ±0.3% accuracy from 200A to 2000A, compared to a standard 200:5 CT which has a ±0.3% accuracy from 200A to only 800A. Both CT’s have ±0.6% accuracy from 20A to 200A. The 500:5 Encompass CT has equal to or better accuracy rating across the entire 20A to 2000A range. It is important to note that accuracy class only defines the “tolerance of error” allowed in a CT. Actual test results are also an important factor when evaluating CT’s. At a typical burden of B-0.1, the Encompass CT test results slightly outperform a standard CT, even at the lowest test amps. All Encompass test results are well within the IEEE limits. vary, within defined test tolerances.